We're still not exactly sure when the Samsung Galaxy Note 9 is going to appear, but it shouldn't be long now. The latest leak to hit the web details the top-end spec for the device currently under consideration at Samsung – and it's quite something. An "industry insider" with a decent track record of tips told Android Headlines that one variation of the Galaxy Note 9 is going to pack in a hefty 8GB of RAM and 512GB of internal storage. That would be a new high watermark in terms of specs for the series – the Samsung Galaxy S9 Plus tops out at 6GB of RAM and 256GB of storage. Even the inside source admits that isn't yet set in stone though, adding that certain markets may see that configuration if they're "lucky". Samsung has a long history of offering different choices of specs to customers in different parts of the world. As per the same source, there's also a "Teddy Brown" color heading to the Galaxy Note 9, so if you like your phone colors a little more earthy and muted, this could be the flagship phone for you. An in-screen fingerprint sensor is a possibility, but not a very likely one. We're expecting the Galaxy Note 9 to appear with the same chip as the Galaxy S9 phones – namely the Snapdragon 845 or the Samsung Exynos 9810 depending on where you live. That should be combined with Bixby 2.0, a major upgrade for Samsung's digital assistant app, and possibly a large 4,000mAh battery too. 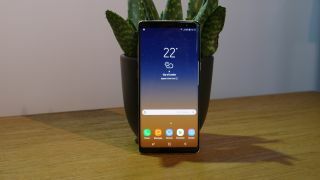 The screen size is still something of a mystery, though there's talk that the display might be 6.4 inches in size, up from the 6.3-inch screen in the Galaxy Note 8. If Samsung can work some magic on the bezels, the physical size of the phone might not have to grow.